Welcome to the Matzkos’ Lake Santeetlah Cottage! Located in Graham County, North Carolina, the Matzkos’ Cottage is nestled at two thousand feet on Thunderbird Mountain, a peninsula nearly surrounded by Lake Santeetlah, a 2800-acre lake in the TVA system noted for its deep, clear water. Thunderbird Mountain is seven miles north of Robbinsville, North Carolina, six miles from the southwestern edge of the Great Smoky Mountains National Park, and approximately fifteen miles from the Tennessee border. Graham County is relatively undeveloped and has few of the attractions associated with Cherokee (50 miles), Gatlinburg (77 miles), or Pigeon Forge (70 miles)—although these tourist-oriented towns are within driving range for day trips. The Cottage usually appeals most to “outdoor people,” those who enjoy camping, canoeing, fishing, or riding and hiking the hundreds of miles of mountain trails provided by the National Park Service and the U. S. Forest Service in western North Carolina and eastern Tennessee. 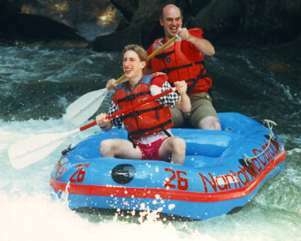 Fine white-water rafting is also available down the Nantahala Gorge, about twenty-five miles from the Cottage. Lake Santeetlah: Surrounded by undeveloped national forest land, beautiful Lake Santeetlah offers boating, fishing, camping, and other recreational opportunities. Great Smoky Mountains National Park: Just a few miles from the Thunderbird Mountain Cottage, the Smokies, the most visited national park in the United States, has dozens of hiking trails. White-water Rafting: The Nantahala River Gorge, about twenty-five miles south of the Cottage, is one of the most popular white-water rafting destinations in the East. And for the whitewater connoisseur, the Cheoah River, literally within walking distance, has recently become an occasional Class IV rafting experience. 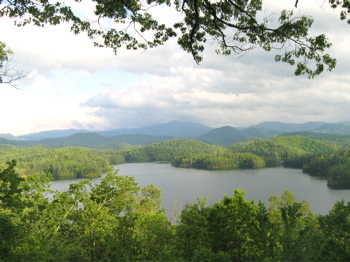 Camping: There are many places to camp near the Matzkos’ cabin, including sites around Lake Santeetlah and in the Great Smoky Mountains National Park. Hiking: From the leisurely trails in nearby Joyce Kilmer Memorial Forest/Slickrock Wilderness Area to more strenuous trails, such as Charlie’s Bunion and Alum Cave Bluffs in the Great Smoky Mountains National Park, there is day hiking for every interest and ability. Sightseeing: You can enjoy spectacular panoramic views along Cherohala Skyway, visit Fontana Dam, the tallest dam east of the Rocky Mountains, or enjoy cultural attractions on the Cherokee Indian Reservation at the southern entrance to the Great Smoky Mountains National Park. Relaxation: One of the most enjoyable activities at the Cottage is doing nothing at all. 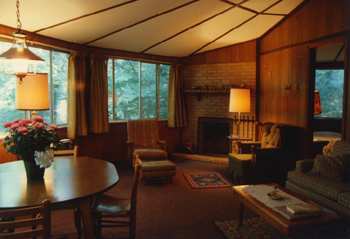 Read a book, play board games, or just marvel at the beauty of the trees and lake right outside the living room window.